"When I visited Hofstra for the first time, I was just walking around campus with my Dad, and we met a student who was incolved with the radio station. We were talking about radio and the communications industry, and he was raving about how great communications is at Hofstra. Then I met a film student who was raving about studying film here. I left campus with that in mind and with a bunch of brochures in hand. 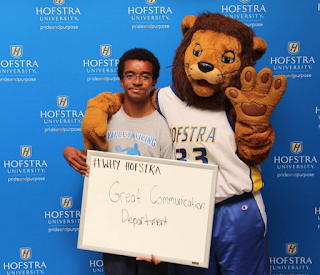 I just kept reading about communications at Hofstra and how incredible it is. And once the serious research started about where I wanted to go, Hofstra really stood out."